The KBShimmer Blogger Collections have definitely been fun to watch over the years, and this past Fall 2017, one especially caught my eye! Created with Michelle from Ehmkay Nails, High-rise To The Occasion starts with light grey crelly base has rainbow flakies and violet shimmer. The shimmer makes the polish almost looks lilac in low light which makes me super happy. I used Morgan Taylor ReactMax Optical Brightener for my base coat, three thin coats for the polish and finished with Glisten & Glow top coat. I put the bottle upside down for an hour before applying so that the flakies would float up to the top. Originally I thought this polish was going into my purge pile but after putting it on, I really do like it and it's staying in the keep for now. Granted, I bought this before the rebranding but you can still purchase this polish on the KBShimmer website with the new branding/bottle logo. At the time of this posting, this polish is available for $10. 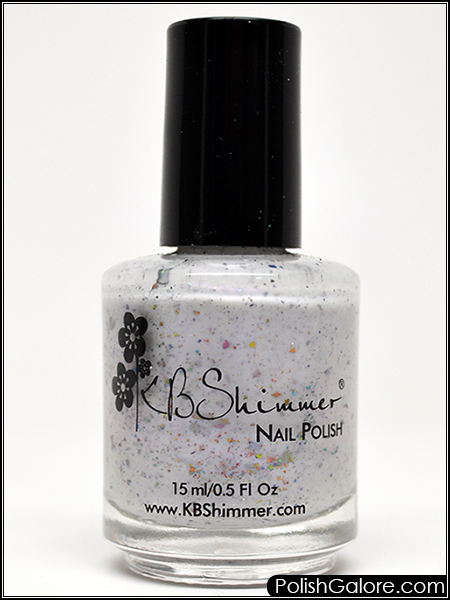 You can purchase KBShimmer on their website or internationally through their stockists. join the social conversation on Facebook, Twitter, Pinterest, Instagram and YouTube.